Abbott’s Captain’s call a Titanic disaster at Press Club today. 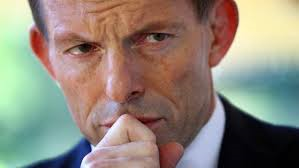 Abbott pensive but incapable of real reflection. Tony Abbott has declared himself ‘a very good captain’ of his Government’s team, after weathering a blistering tsunami of criticism, derision and withering contempt following his recent bizarre decision to confer an Australian Knighthood upon his Royal Highness, the Prince Philip, Duke of Edinburgh. All hell broke loose, according to most observers, partly because of Abbott’s bad decision itself but mostly because it was the last belaying pin of the breech ropes on a very loose cannon finally, irretrievably coming adrift. For Abbott himself, it was merely ‘a bit of a rough patch’ and a ‘stuff up’; and all he needed to do was to apologise and entrust choice of awards recipients to a committee. It did not seem to enter Abbott’s head that ‘a very good captain’ is defined by his very good decisions. Abbott’s latest desperate boast has pundits scratching their heads and wondering how any sane person could confuse the Abbott brand of leadership with ‘very good captaincy’. No-one, in his or her right mind could. Unless, perhaps, you see Abbott as an anti-captain, an alienated, inarticulate, bewildered, existential hero in the changing Australian political narrative; a story which since The Dismissal of Whitlam has ‘moved forward’ from epic to ironic. In this perspective, Abbott is a product of the times, a cynical caricature of the qualities of commitment, judgement and enlightened conscience as set down by Edmund Burke, a leader in words and deeds, whom, ironically, Abbott felt he could quote with a straight face in his Press Club appearance today. Or could he just be mad, bad and easily confused? Or both? Whatever the cause, it is hardly the first time Abbott, the pathological gaffer, has seemingly been so overwhelmed by opportunity that he has come up with something so wrong and so stupid that he has taken everyone by surprise. Abbott’s political career has been characterised by many sensational lapses of judgement, including his decision in 2010 to publicly inform the nation of his natural tendency towards mendacity during ABC TV’s 7:30 report. The then Opposition Leader astonished the nation when he said his only utterances that should be regarded as ”gospel truth” were carefully prepared and scripted remarks such as those made during speeches or policy pronouncements. Otherwise, statements he made during the ‘heat of discussion’ such as radio interviews or under questioning at press conferences, were not necessarily reliable. Given this context, the immediate reaction of most who heard of Abbott’s lunatic decision to knight the Duke, a less than chivalric type by nature and a curmudgeon by design were about to laugh it off. Abbott had misspoken; he was misreported; he was making a joke. It was another gaffe or another outburst of Abbott madness. When it became clear it was ‘gospel truth’, this was quickly followed by an angry incredulity in which Australians wondered aloud at their Prime Minister’s alarming stupidity and lack of judgement. Many saw his action as suicidal, a ritual hari-kari with the dull edge of the ceremonial sword of the accolade. So strong, indeed, appeared the kamikaze element in his indecorous over-decoration of Philip in what he claims was his own decision, a captain’s call that reporters immediately began to canvass other contenders for the position of Prime Minister. Some such as the colourful ‘side-show’ Mal Brough (so called because everywhere he went as NT minister there was a circus) were said to be preening their own feathers before a run from the backbench. Or there was a frisson of interest reported between Turnbull and Bishop, provided each put the other first. Others, including anti-knight-errant Rupert Murdoch sought to scapegoat the PM’s chief of staff, Peta Credlin, on whom, it was felt, a great deal could be blamed, given that she was Abbott’s eminence grise and given that she was a woman. Blame the sheila, was Murdoch’s advice to anyone not paid to listen confirming that whilst Rupert may have renounced his Australian citizenship to become an American, he was still a true blue unreconstructed Aussie male chauvinist when it mattered. Abbott would have none of this. He claimed his move was prompted by a desire to acknowledge all the very many good things that Philip had done for all Australians, and that it was all his own idea, a decision taken without consultation or any real advice, although he did profess to have confided in another knighthood recipient, the retired Air Chief Marshall Sir Angus Houston and model of Olympian detachment and to the Governor General. In essence, however, it was all his own, a captain’s call or a captain’s pick. And as furious dissension reached white heat, in another flurry of preposterous waffling, he reminded us all of his high opinion of his own leadership. He was one hell of a captain. Or at least, ‘a very good captain’. So there we have it: Abbott’s most recent Captain’s call has been to remind the nation of his captaincy. Whilst Abbott’s latest act of naked self-promotion may seem immodest, presumptuous and inappropriate, it also reveals the extent of his desperation to cling to some vestige of power. OK, he is saying, the knighthood for the Duke was a stuff up but I really am a top captain. Just look at my team. Let’s not waste time navel gazing; reflection and introspection are only for wimps; real men apologise for ‘the stuff up’ and move on. Unfortunately, Mr Abbott, the nation is looking at no-one else but you thanks to your stuff-ups. You have guaranteed its full and undivided attention. The nation is wondering what mistake could be next. You have control of a fair bit of firepower and a track record of preferring to shoot from the hip and apologise after. And even an average captain would never have made the Prince Philip knighthood call. And looking at the team only makes it worse. Attempting to take credit from a team which no-one in their wildest dreams would call a dream team Mr Abbott gets you even further into trouble. Your nightmare team has done so little to take credit for that your call can only be ironic. Your own captaincy remains even less illustrious as was revealed when you bestrode the stage of the National Press Club today like some bad parody of a modern political colossus. All eyes were on you to make the speech of your life. In the end it was a rehash, a warmed over repeat of the same mindless platitudes, the vapid, empty slogans that got you into trouble in the first place. You showed the nation once and for all the job was too big for the man. It wasn’t a resignation speech in your mind, perhaps, but it served the same purpose. If ever a captain’s call were called for this was the time and place. In the end it wasn’t a captain’s call or even a decent speech but merely a reprise of the same turgid, clapped-out rhetoric of the campaign stump. Only in this case, time has moved on, Mr Abbott; the tide has run out and left you stranded, high and dry, however much you wave your arms or flap your gums. « On the nose, sidelined, Abbott’s fate hangs on result of Queensland election.